treating or minimising the risk (includes accepting the risk if it is acceptable to the organisation). The total process of risk assessment and management is referred to as risk management. What is the activity we are about to do? How can it harm those involved? What action can I take to reduce or remove the risk? 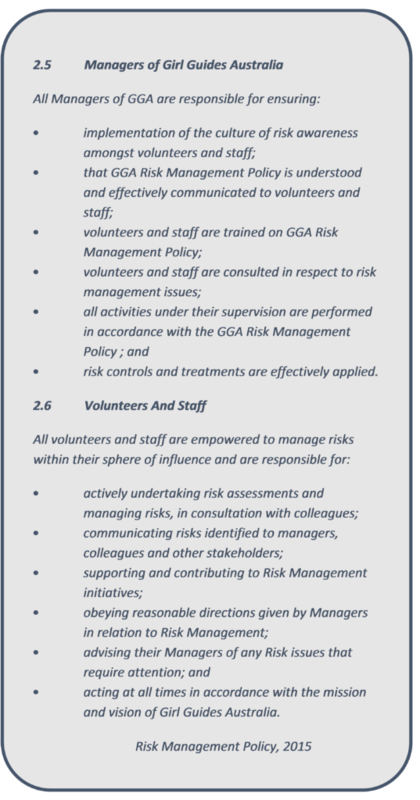 Risks should also be identified when carrying out new activities, when there are changes in volunteers and as part of the everyday management of properties, finance and members. Consider what factors such as activities, practices, processes, compliance requirements, liabilities, influences or obligations contribute to the Risk. 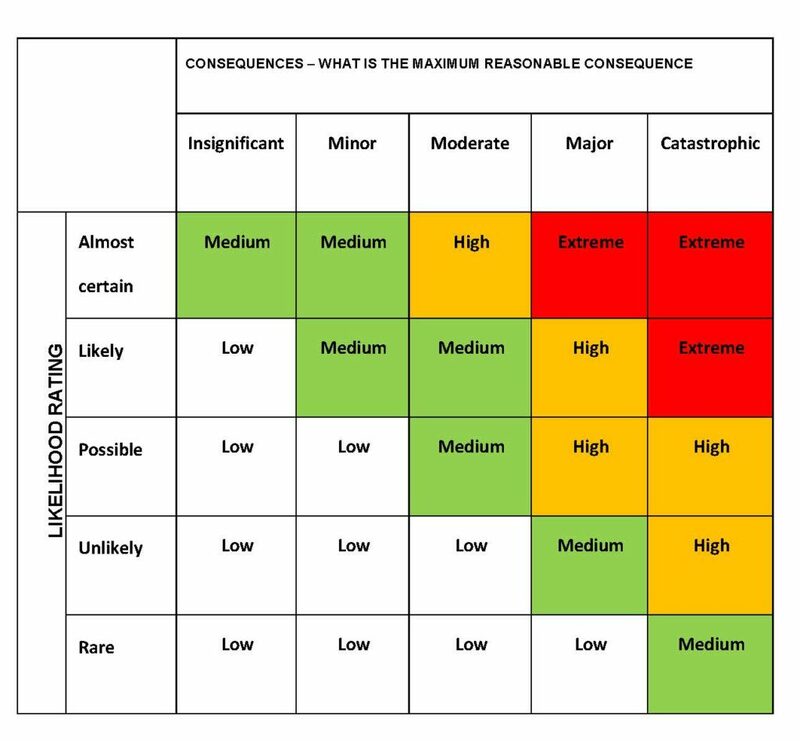 A vital step in controlling Risk is realistically and objectively identifying the actual causes of the Risk, to enable a more accurate forecast of negative Impacts that are to be assessed. It also enables required Actions and Treatments to be directly targeted and applied to those causes in an effective/efficient manner. Low level risks are managed by the Leaders but should be monitored periodically by the Region Manager and / or District Manager. Moderate risks are normally dealt with by the Region Manager or District Manager. If there is a high risk in your area of responsibility you should inform your State Risk Management Representative. A risk that is catastrophic must be immediately highlighted to your State Girl Guide Organisation. retain the residual risk – i.e. accept that a low level of risk may remain. GGA has produced a hierarchy of control diagram which can assist in working out the best control for your risks. Ideally start at the top for the most effective way of reducing the hazard and work down until you are happy that the risk has been controlled. All members have a role to play in risk management through being observant and taking ownership and responsibility. As part of the implementation of the Risk Management Policy, all Leaders and Managers attended a two-hour Risk Management Workshop – “Being Safe”. For Leaders that content is now included within the Leadership Qualification training course and for Managers there is a ‘Minimising Operational Risk’ webinar. The risk assessments and action plans include generic templates for routine activities such as craft activities, cooking activities, internal and outdoor games and food handling. It is good practice to ask Leaders to assess their term program for risks and to add a risk overview to the program book, answering the three questions – what are we going to do, what could happen, how can we make it safe. An example might be a pool visit as part of a term program based on a water theme. The risk assessment could cover the presence of pool lifesaver/s and knowing the swimming skills of each girl. As these activities are not in the hall, parents and the District Manager will need to be informed. For some events or activities or processes, specific assessments and plans should be compiled, e.g. significant decline in youth membership. All Managers and Leaders have a ‘duty of care’ to the girls in their charge, other Leaders and volunteers. This duty means adult members are responsible for ensuring as far as is reasonably practicable that the health and safety of girls, other Leaders and helpers is not put at risk from any role or work they are engaged in while attending a Guiding activity. You also have a duty to yourself to take reasonable care of your own health and safety and to ensure anything you do or don’t do, does not adversely affect the health and safety of other people. provide first aid facilities and trained personnel.